Be the first to share your favorite memory, photo or story of Lori. This memorial page is dedicated for family, friends and future generations to celebrate the life of their loved one. 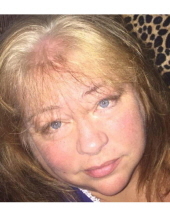 On Saturday, April 13, 2019, Lori Lee Beck Richardson passed away at her home in Corunna, MI at 50 years old. Lori was born on July 1, 1968 in Flint, MI to Edwin Duane Beck and Kathleen Therese Minor. She graduated from Owosso High in 1986 and continued her education to pursue her ongoing career in the funeral industry. She loved to play Roulette and Bingo, but mostly enjoyed the company of friends and family. Lori was known for her unique sense of humor and adventurous spirit. She leaves behind countless comical memories to all that loved her. Lori is preceded in death by her father, Duane, and mother, Kathleen. She is survived by her three children Michael Anthony Beck (Erin), Charles Robert Tyler Richardson, and Ian Alexander Richardson and grandchildren Todd Anthony Massaway Jr. and Skyla Jade Beck. Also surviving her are two siblings Nicole Beck Frith and Jason Schultz (Carla), nieces and nephews including Miranda, Trey, Lily, Asher, Ian, Abigail, and Emily. Lori is also leaving behind lifelong friends Lisa, Tina, and D.J. (Ian) Cantu. A Christian memorial service will be held at Immanuel Baptist Church in Corunna, MI on April 18, 2019 at 5:30 pm. Immediately following, Immanuel Baptist Church is graciously hosting a dinner for all family and friends to attend. Lori’s remains will be scattered at Niagara Falls. Nelson-House Funeral Home assisted the family with arrangements. To send flowers or a remembrance gift to the family of Lori Lee Richardson, please visit our Tribute Store. "Email Address" would like to share the life celebration of Lori Lee Richardson. Click on the "link" to go to share a favorite memory or leave a condolence message for the family.